I managed to sample a gluten free wrap in Costa Coffee www.costa.co.uk in Walton-on-Thames, Surrey. I'd heard that Costa was offering this, but I'd not been able to find a branch that sold it. As it was, I bought the last one. It was a chicken and basil salad gluten free wrap with basil mayonnaise, tomato and wild rocket. It was a joy being able to eat lunch in Costa; normally I have to go elsewhere as there is nothing I can eat. Kepp up the good work, Coata! 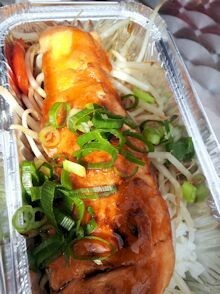 In Kingston Market-Place www.kingstonfirst.co.uk I visited the Namu Japanese street trader and indulged in Salmon Teriyaki Donbu - grilled salmon with boiled rice, vegetables and teriyaki sauce. You can watch the world go by sitting on the wooden tables and chairs. Ray enjoyed Pork Katsu Donbun - pork katsu with boiled rice, vegetables and katsu sauce. He's been here before and recommends it. Joanna Fuertes-Knight graphically wrote about the flatulence she experiences as a result of her lactose intolerance in The Guardian www.theguardian.com/uk She mentioned that Orseo biscuits are dairy-free. Yes Joanna that's right but they aren't gluten free which is a pity. Ray loves Oreos as well as fig biscuits by Jacobs www.123healthbalance.com, but you have to be careful about the ones called "fig bars" as they always seem to have milk in the pastry. He can also eat Bourbons and Hobnobs without chocolate. When it comes to cereal bars, you have to examine them carefully because of milk, gluten or wheat content. One of our favourites is Eat Natural www.eatnatural.co.uk date and walnut with pumpkin seeds bar (which we can both eat!) Also beware yogurt coated cereal bars if you're dairy free. Eat Natural's seasonal varieties are worth looking out for. Heck sausages www.heckfood.co.uk/sausages All their sausages are gluten free. Ray & I enjoyed sampling the Smoky Chorizo-style sausages which are also dairy free. They have a succulent flavour, but aren't too hot and spicy. 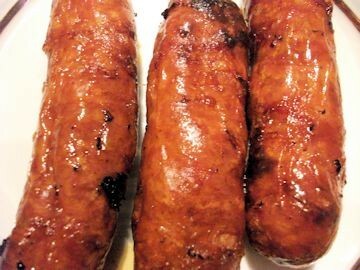 Compared to other gluten free sausages on the market, there was much more flavour. We'll definitely be having these again. The web site lists stockists or you can buy them online. I can't remember the last time I ate a donut - 15 years maybe? So it was with great delight I ate gluten and wheat free frozen donuts from Feel Free for Gluten Free www.feelfromfoods.co.uk Keep them in the freezer and thaw one by one. 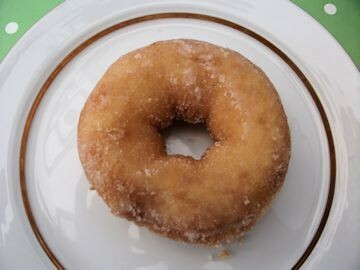 Leave the donut for about an hour at room temperature to defrost and enjoy! They are sugared ring donuts with four to a pack. Yummy! You can buy them from their online shop www.glutenfree-direct.co.uk A pack of four donuts costs £3.99. I'm sure it won't be long before supermarkets stock them. I've kept them hidden from Ray because they contain dairy. Arriving early and ravenous we visited Iydea Vegetarian Kitchen, 17 Kensington Gardens, Brighton www.iydea.co.uk Its menu carries symbols for gluten free and vegan. Several dishes offer gluten free or vegan options. 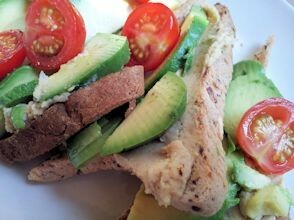 I enjoyed Avocado on Toast - avocado, hummus and cherry tomatoes on gluten free bread (£4.75) while Ray had the vegan version of Banana Nut on Toast - peanut butter and bananas on wholegrain toast, washed down with tea and soya milk. For a reviving cup of tea we revisited Chocaffinitea, Gloucester Road, Brighton www.chocaffinitea.co.uk which offers 17 varieties of loose leaf tea. We opted for Assam which was beautifully presented in a transparent glass tea pot with a timer giving options of 3/4/5 minutes. 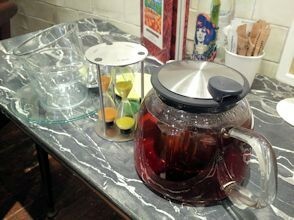 We were advised to leave the tea for 4 minutes. This cafe also offers an astonishing array of chocolate. Most importantly it serves gluten free and dairy free cakes. Its web site has a recipe for a dairyfree cheesecake - I'm definitely going to try that one. After wandering through the lanes of eclectic shops, we found Food For Friends www.foodforfriends.com which we hadn't visited in years. It's a relaxing haven away from the hustle bustle of Brighton. 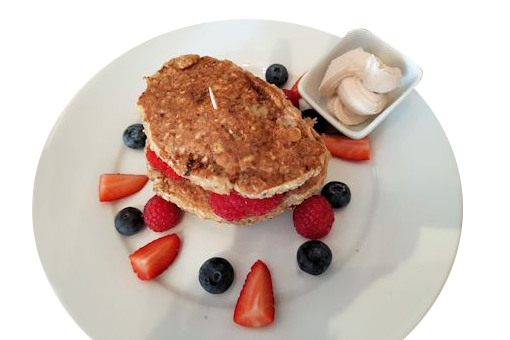 Its menu usefully carries symbols - V vegan, VO vegan option, GF gluten free, GO gluten free option; N contains nuts; S contains sesame seeds; LF low fat, LC low carb. It's so refreshing to see this on menus and makes life so much easier for all concerned. 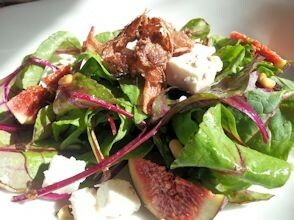 I chose fresh fig basil and smoked ricotta salad, N, GF, VO, LC - vegan option is crispy tofu. I ordered the cheese version and was delighted with the combination of flavours - the sweetness of the figs contrasting with the cheese. Ray selected "Duo of Sweet Tofu Pockets" V, LF, GF, N. The first pocket contained shitake rice and pine nuts, while the second had butternut squash, tofu and miso served with pickled ginger, wakame and sesame mirin dressing. The entire meal was a real treat. 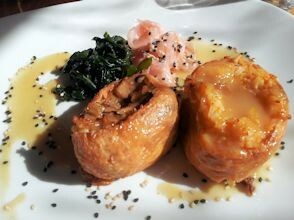 Ray says this was one of the best meals he's enjoyed - but he always seems to say that!